15 March 2019. Weekly catch up; How to post Videos; Redarc Winner announced; How to get our app & offline maps. We love giving stuff away so it's always a pleasure to announce the lucky winners of the Redarc Power Prize Draw, which comes around every 3 months. Keep reading to find out who won, and view our Weekly Catch up feature. We seem to have a bit of a theme this week with a lot of content appearing around the Nullarbor region and quite a few members recently doing the east-west or west-east journey so various Place updates, Blogs and User Trek are appearing from that region. USER TREKS: another 17 new user treks have been added since our last newsletter and all except one being recorded via the ExplorOz Traveller app so these are all live GPS driven treks. As you can see when you look through the list of New User Treks (click grey tab near top of page in the Browse By section), it is great when people give their treks names that match the area of travel and keep it short, say a few days to a week of travel. Some people even log their treks by day, which is also fine. The app gives you the option (if you're a member) to use the Track Logging feature which auto-syncs your stored tracking data to our server so your family and friends can keep an eye on your trip progress, and if you save these logs that creates the User Trek. However the app also features a Positions Manager that allows you select a start date and end date and will build a user trek for you at the end of your trip using all the stored recorded positions collected during that date range (this can be done without Membership). Take a look through User Treks and whilst there is a "mud map" shown at the top, be sure to click the grey button further down the page to open the actual map (that can be zoomed so you get the full picture). If you're lucky the traveller may have written up a description about the trek, and added photos for you to enjoy. If you are a Member, you can download any User Trek in GPX format but note these do not include any waypoints, so if you open it in OziExplorer you'll only see the line of the track as it is shown on the website and it depends on what map selection you use in OziExplorer to view it with. On our website the User Trek map is EOTopo. So mostly you'll find looking at other people's User Treks useful as a source of inspiration and give you an idea of what is accessible. Member 2208mate has been busy Blogging the last few weeks and has added video footage into his Blogs, including use of his drone. His latest Vlogs (that's what you call blogs that have videos) feature the Gunbarrell Highway, the Nullarbor cliffs, and Wolf Creek Meteorite Crater. There are quite a lot of other blogs being posted but the Members are making these private so that they cannot be opened unless you have the security key, so sorry I cannot share those ones with you in this newsletter. Trending posts & highlights - since our last newsletter there's been 3 pages full of posts, with one discussing Personal Attacks (a big discussion looking for how to stop it happening), plus other interesting topics such as Lake Eyre, Worthwhile attractions to see in Southern South Australia, WA - Yilgarn Area, School Project - Offroad Survival Kit with built in EPIRB. New & Updated Places:Ceduna Oyster Barn, La Balsa Park, Star of Greece Shipwreck Memorial & Lookout, Aldinga Scrub CP Lookout, Sellicks Coast Park Lookout, Pete & Jackies Lookout, Nan Hai Pu Tuo Temple, Myponga Reservoir Lookout, Carrickalinga Lookout, HMAS Hobart Memorial Lookout, Second Valley Jetty, Old Winch, Cape Jervis Lookout, Tumut 3 Power Station, Mooloolaba Beach Caravan Park, Mount Bogong, Kalbarri Anchorage Holiday Village, Gentle Annie Camping Reserve, Lake Lascelles, Point Cartwright, Jillah Rockhole, Koomooloobooka Cave, 222k peg rest area. We are very pleased to announce the latest Redarc prize draw has was been won by member Dan H4 who was a new Member (joined as a Lifetime Member). Dan receives a Redarc 10amp SmartCharge AC Battery Charger from DEFA which provides safe and effective charging of larger 12v batteries in cars, caravans, camper trailers and boats. Valued at $275. To be the running to win in this prize draw, you will need to either be a Lifetime Member at the time of the draw, or have paid your Membership Renewal within the current competition period. Members will see this incentive in their renewal email reminders. See Membership Subscription options here. 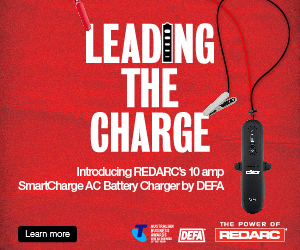 Find out more about the SmartCharge AC Battery Charger by clicking the image below to go to the Redarc website. Are you the lucky owner of a drone? Do you love photography? Do you want some ideas for how to share them to ExplorOz? If your photo is of a specific place, then open the page on our website in the Places section that features that location and post it there (using the button labelled "Add Photos & Files). Our image uploader will automatically resize your image to an appropriate file size so there is no need for you to compress the file and in fact it's better if you keep it at original size. However, please ensure you don't upload RAW image file formats, but convert to jpg first please. So just click the "Video" button and this box will appear. Select either the YouTube or Vimeo box and follow the instructions for what to enter in the space provided. This will only make sense if you've already published your video on YouTube/Vimeo. The App provides the tools for navigation, map viewing and trip planning, plus access free online mapping with 18K EOTopo, Streets & Paths, and Satellite map images for whole of Australia, free Places (90,000 POIs), and free Treks (187 ExplorOz Treks with place to place guidance). "App" is short for "Application" and is the terminology used by Android, iOS and Windows for software programs. Our app is called "ExplorOz Traveller" and you will find it available to purchase and install from the Google Playstore, Apple App Store, and Windows Store. The app is designed to work with the EOTopo maps offline, so you will need a license to download and install the offline maps within the app. If you do not already have an existing EOTopo map license from a previous purchase then you will need to purchase the ExplorOz Traveller Premium Offline Maps license for just $49.99. This is a whole of Australia offline EOTopo mapset that will zoom in to 144K scale. We prefer customers purchase the ExplorOz Traveller Premium Offline Maps direct from us - please go to our shop (you will find the same product is offered to you via your app store but by buying direct you can ensure that we, the developer, retain the full proceeds of each sale, thank you). BONUS: you only need to purchase 1 map license, regardless of how many devices and what operating systems they use. Maps are downloaded in-app after you login and your license is validated. This means you'll always get the right version for your device. Existing Members (paid subscribers) will automatically have access to the track logging feature in the app, however if you're not a Member, and want to access the track logging (for auto-syncing your track log to a map page on the website for your family/friends to follow your trip progress) then you will be pleased to know that you can take advantage of our special discount to new app users and you'll get $20 off the Membership subscription for 12 months. This $20 discount is automatically applied ONLY if you've installed the app and then purchase a 12 month membership subscription (this is purchased from our shop and you must be logged in for the system to allocate the discount automatically).